Instagram first launched in October 2010, and it was an instant success. By December 2010, it already had one million registered users, and six months after that, they reached five million users. Now, Instagram has over 30 million registered users and has been used by top brands like Burberry, Nike, and even the Grammys. 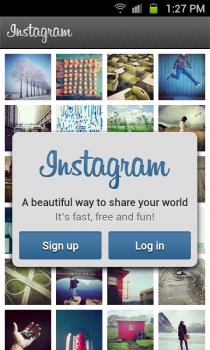 Apple even named Instagram the “App of the Year” for 2011. Instagram’s popularity has largely been because of their vibrant community of iOS users. 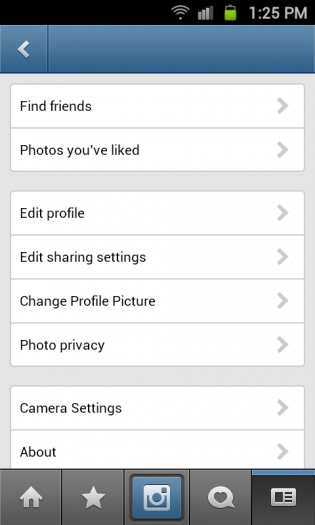 Now, Android users can join in the photo-sharing fun with the recently launched Instagram app available on Google Play. 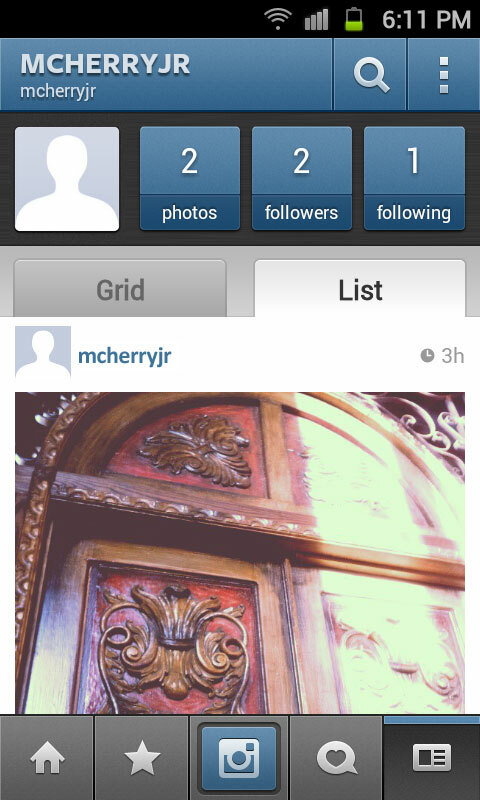 Let’s take a look and see how Instagram on Android works. When you first use the app, you’re greeted with a welcome screen. From here, you can log in (if you have an existing Instagram account from an iOS device), or you can sign up for the service. 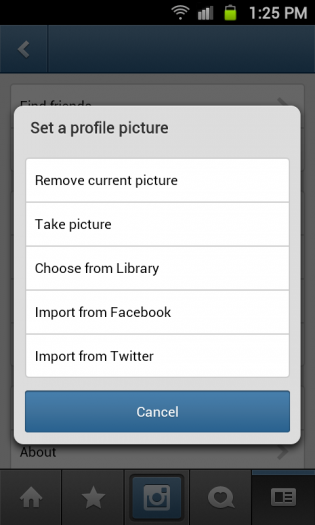 Unlike most camera sharing apps on Android, you must create an account in order to use this app. 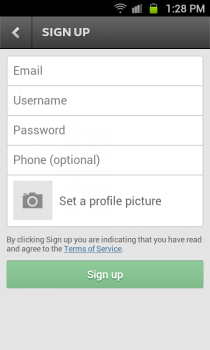 Signing up for the app requires your email and your choice of username and password. Adding your phone number or setting a profile picture is optional at this point, but you can add either to your profile once signup is complete. If you already have a username and password, logging in will take you directly to the home screen. 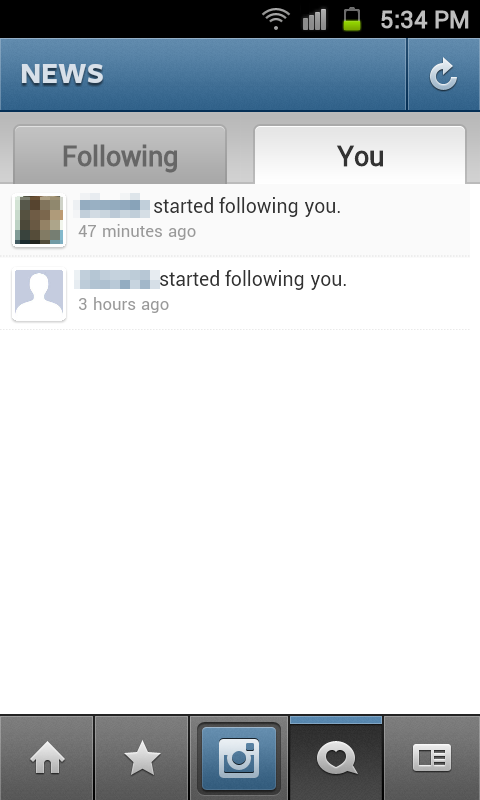 Once you’ve signed up, Instagram gives you three options for finding friends to follow. 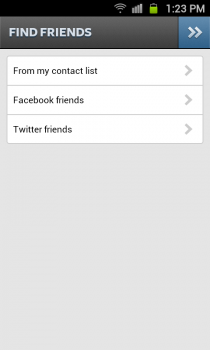 You can choose from your contact list, your Facebook friends, or your Twitter friends. 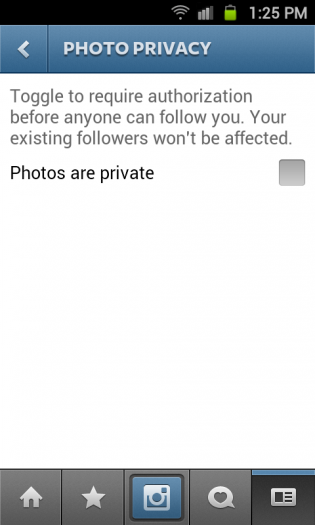 With either method, you’ll be shown a list of your friends who are on Instagram. Tap the “Follow” button on each row to follow your friends individually, or tap the “Follow All” button at the top right corner of the page to follow everyone in the search results. 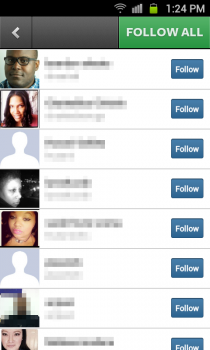 Once you’ve added your friends, you’re taken to another screen with more friends to add — Instagram’s suggested users. You can bypass this screen by tapping the “Done” button in the top right corner. The home screen for Instagram is split across five tabs, each of which are described in detail below. The first tab (indicated with a home icon) shows a feed of your images and your friends’ images. You can scroll through the list vertically, read comments, or leave a comment of your own on each photo (just tap the comment bubble button). Tapping the heart button under each photo marks it as “liked.” There’s a trio of dots in a horizontal line under the bottom right of each photo. If you tap these dots below each photo, you have the option to delete the photo or share it using your default Android share options. Tapping the trio of dots on one of your friends’ photos gives you the option to flag it for review. I found this to be a bit inconsistent. What if you wanted to share your friends’ photos? It doesn’t seem very clear how you’d be able to do that. 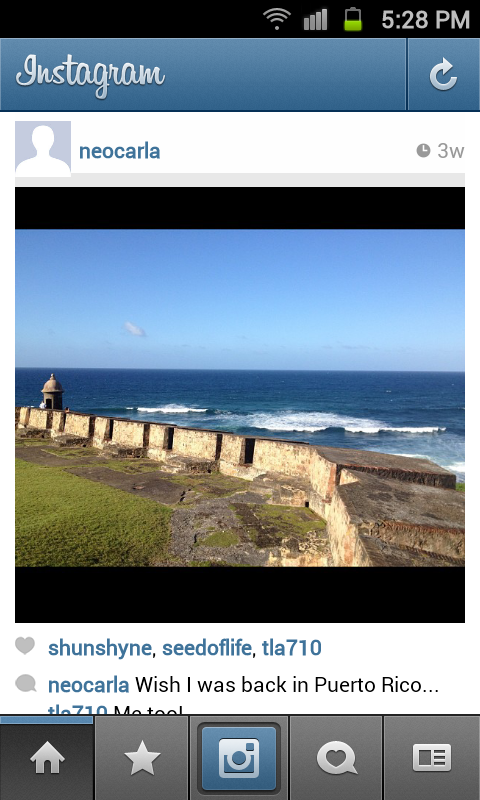 Tapping the refresh button at the top right corner refreshes your feed for any new photos. 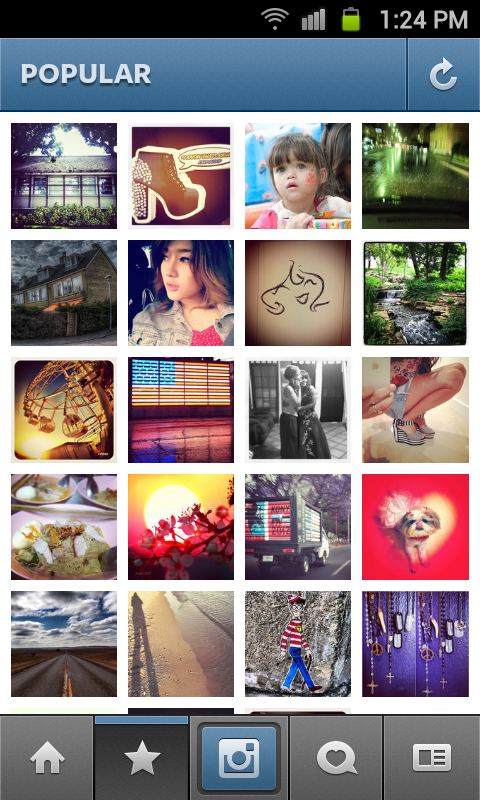 The second tab (indicated with a star icon) shows a grid of the most popular images currently on Instagram. 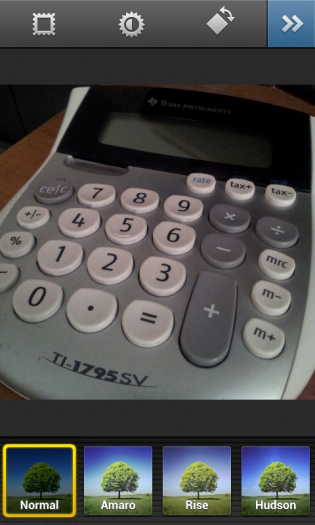 Tapping each photo brings you to the individual photo’s page. From here, you can tap the heart button to “like” the photo, you can tap the comment bubble button to leave a comment, or you can tap the trio of dots to flag the image for review. On both the Popular tab and on the individual photo page, tapping the refresh button at the top right corner refreshes the page for new information. Taking photos is one of the main features of Instagram. 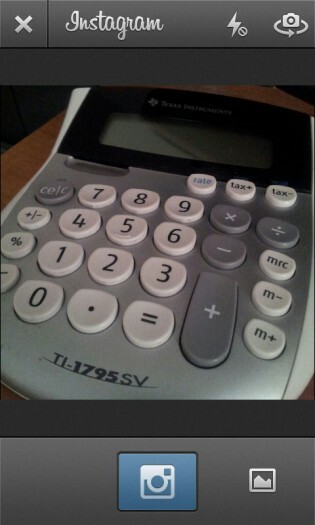 The blue button in the middle of the tab row brings up your choice of Instagram’s camera or any camera app on your phone. If you use another camera app, you can snap a photo using that app and automatically import into Instagram, where you can add filters and then post it to your feed. 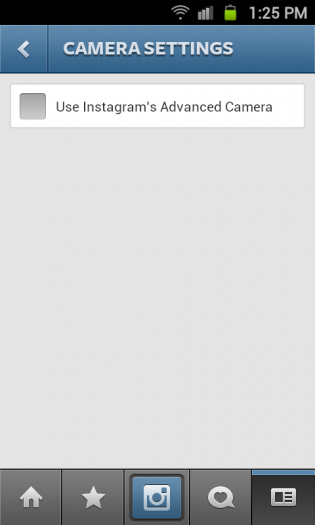 Instagram’s “Advanced Camera” (which is how it’s referred in the Settings) functions like any normal camera application. If your device has a flash or a front-facing camera, you’ll have icons at the top right to access those. Tapping the photo icon in the bottom right corner lets you import a photo stored on your device into Instagram for editing. All images are cropped to a square, so you can’t include wide shots or full portrait/landscape views. Once you have your photo, now you can start making creative edits. The icons along the top allow you to toggle a frame for your photo (each lens has a different frame), adjust brightness and contrast (which is also different for each lens), or rotate the photo clockwise (90 degrees for each tap). 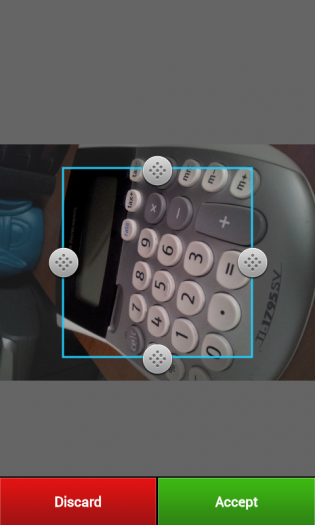 Along the bottom, you have eighteen filters to choose from that mimic certain nostalgic camera and film combinations. After your lens and frame have been applied, you can add a caption or geotag the photo, and then upload it to your Instagram feed or your social networks (Twitter, Facebook, Foursquare, Tumblr). The fourth tab is the News tab, though you wouldn’t really know that from looking at the icon (a comment bubble with a heart in it). On this tab, you can see an activity feed of your followers (including who followed them and photos that they liked) as well as your own activity. Tapping the refresh button in the top right corner refreshes both feeds. The last tab here is for your profile. From here you can see your profile photo, and check your number of followers. Your photos are also available here in either grid or list format. 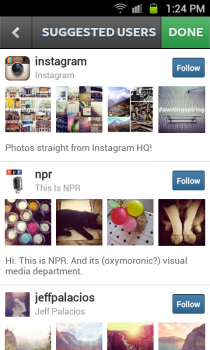 The magnifying glass at the top of this page lets you search Instagram by username or by tags. Tags are hyperlinked words that you add to your comments using a hashmark (e.g., #buildmobile). Tapping the button at the top right corner of your Profile page brings you to the Settings menu. You can find more friends from here using either your address book, Facebook account, or Twitter account. You can review the photos that you have “liked.” There’s also the ability to edit your profile here to add more information (birthday, homepage URL, gender, short bio, etc. ), edit your sharing settings and photo privacy, or enable Instagram’s “Advanced Camera.” You can also log out from the app on this page. One thing you may have noticed from looking through these screenshots is the lack of attention given to the Android design environment. Android comes with its own set of patterns like long presses, swipes, and multi-pane views. When using the Instagram app for Android, you get a sense that none of this was taken into consideration for designing the user interface for the user. 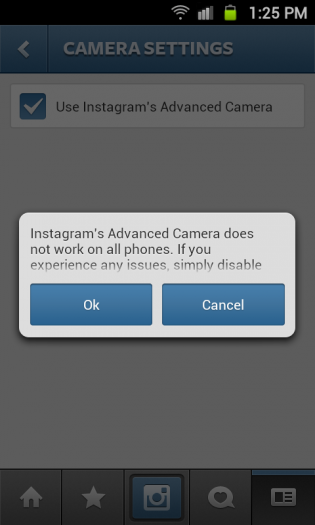 Android design encompasses a core set of tenets known as “Pure Android.” The Instagram app breaks every one of these tenets in their interface. UI elements and platform-specific icons are mimicked from the iOS version of the app, there’s a persistent bottom tab bar, there is a labeled back button at the top left corner of nearly every page, and menu options (like on the Settings page) use right-pointing carets on line items. No consideration was given to Android’s dedicated soft keys for searching, stepping backwards through an application, or even the menu button. This makes using the app a chore on Android, and you’ll spend more time tapping between screens than taking photos. Other drawbacks about Instagram on Android include forced cropping of photos, a lack of Flickr integration like in iOS, and the inability to follow tags like you can follow other users. 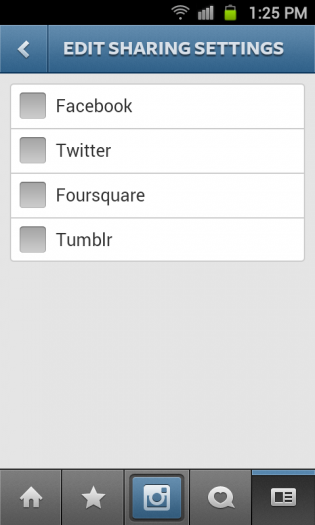 Given that this is on Android, I’m also surprised the app doesn’t make use of Android’s native sharing menu. 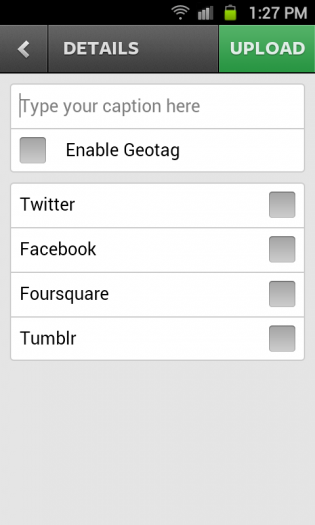 The user is limited to sharing photos through the app using either Facebook, Twitter, Foursquare, or Tumblr. Of course, the biggest drawback about Instagram on Android is that it’s about a year too late for the current Android user. There are dozens of camera applications available on Google Play that mimic Instagram, and in most cases they improve upon its unique set of filters and lenses. For those who are already dedicated to an Android camera app, Instagram may have some initial novelty upon installing, but in the end utility is what’s most important. Instagram brings its unique blend of artistic lenses, filters, and photo sharing to Android users. Unfortunately, that’s all it brings. With iOS interface cues and behaviors shoehorned into an Android app, users may find the constant navigation between screens tedious and unnecessary. There are many other (and better) camera apps available for Android; Instagram on Android offers too little and came way too late. 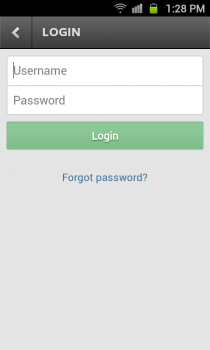 Instagram is available on Google Play for free and requires Android OS v2.2 or higher to run. Download the app from the Google Play Store link below or by clicking on the Google Play badge provided.